1 of 3 Scoop about 18 ice cream balls (about 1 heaping tablespoon each) onto parchment or waxed paper lined baking sheet. Freeze. Repeat with another lined baking sheet and remaining ice cream. Freeze 1 hour. 2 of 3 Toast coconut in dry skillet over medium heat, stirring occasionally, until light brown, 1 minute. Mix coconut, cornflake crumbs and cinnamon in plastic food-storage bag. 3 of 3 Remove 1 sheet from freezer. 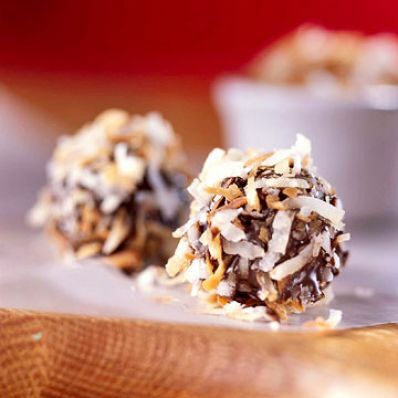 Working with half the balls (refrigerate other half), add 1 ball to coconut mixture; coat; shape into rounds, pressing coating into sides. Return to sheet. Repeat with other balls. Return to freezer. Repeat with other baking sheet. If balls begin to melt, return to freezer. 1 of 1 Drizzle sauces on a plate. Top with 3 or 4 bonbons.